Elijah is a mighty prophet of the Old Testament. He kept it from raining for three and a half years, raised a small boy from the dead, and called down fire from heaven to consume his enemies. But he is most famous for his contest on Mt. Carmel. He arranged a showdown with the prophets of Baal to prove to the people that the LORD is God. Afterward, he slaughtered the false prophets. Fearing the queen, he fled to Mt. Horeb where he despaired to God. A powerful wind, earthquake, and fire came upon the mountain. God was not in any of these but came instead in a gentle whisper. Christians also use this story to emphasize the importance of private devotions. There are many distractions in the world around us. They say we must stop looking for God in the big things and start finding Him in the small things. These interpretations are shallow and thoughtless. When interpreted correctly, this passage has much to offer us theologically and practically. This passage is primarily about election. When Elijah despairs about Israel’s unfaithfulness, God reminds him, “I reserve seven thousand in Israel – all whose knees have not bowed down to Baal and whose mouths have not kissed him” (1 Kings 19:18). The entire nation hadn’t rejected God because He had chosen a faithful remnant. This encouraged Elijah to carry on to the next stage of his ministry. So what’s with the wind, earthquake, and fire? This is how God appeared to Israel on Mt. Sinai when He declared their national election: “Mt. Sinai was covered with smoke, because the LORD descended on it in fire…the whole mountain trembled violently” (Exodus 19:18). He now appears to Elijah on a smaller scale to declare the personal election of His remnant. This adds meaning to Jesus’ transfiguration. Luke says Moses and Elijah spoke with Him “about his departure, which he was about to bring to fulfillment at Jerusalem” (Luke 9:31). I wonder: Did Jesus despair about Israel’s unfaithfulness? Did He feel like His ministry was pointless? Was He afraid His death would be in vain? Did He lament with Elijah, “I am the only prophet left, and now they are trying to kill me too” (1 Kings 19:10, 14)? If so, then Elijah would have been able to comfort Him. 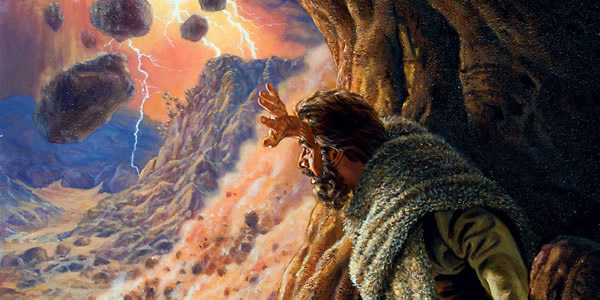 Elijah could have reassured our Lord that the entire nation hadn’t rejected Him, for God had chosen a faithful remnant. So this passage is about persistence in ministry because of election. Have you ever been frustrated in ministry? Have you felt like your efforts were resisted, or your teaching fell on deaf ears? Have you felt like your people will never change? Have you felt exhausted, hopeless, or burned out? Then this passage should encourage you. Based on Elijah’s experience, you can persevere in ministry. You can “always give yourself fully to the work of the Lord, because you know that your labor in the Lord is not in vain” (1 Corinthians 15:58). How does Elijah’s experience encourage you? Leave your thoughts with a comment below!